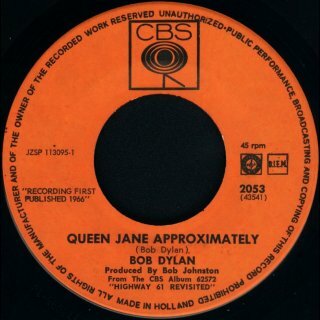 As can be seen, which song was the A- or B-side of this single depended upon the country! 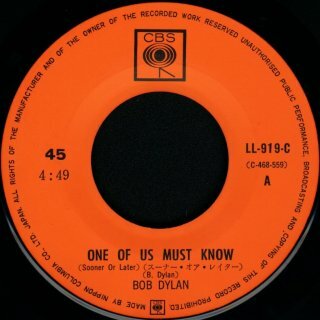 This single came out well before the release of the Blonde On Blonde album! 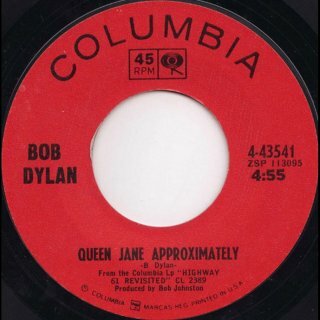 Which song was the A- or B-side of this single depended upon the country, but One Of Us Must Know (Sooner Or Later) was a previously unknown song, and Queen Jane Approximately from the 1965 mono Highway 61 Revisited album would already have been known to fans. Thanks for Gerd Rundel for finding three acetates of this song for sale on eBay in Oct 2016. 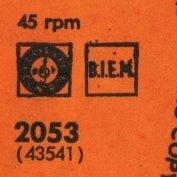 They come in buff sleeves with writing in grease pencil in the centres. All have "CO 89216" written on the sleeves at top left and "Bob Johnston" at top right. 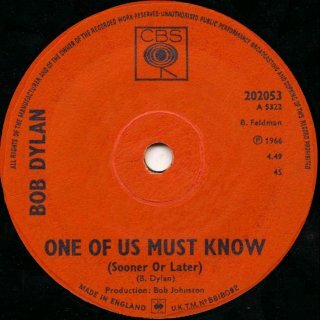 These promo singles had two versions of One Of Us Must Know (Sooner Or Later). 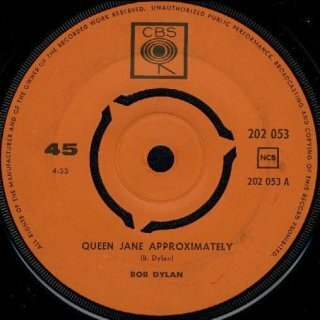 As Blonde On Blonde was released on 2CDs as part of the Oct 2010 9CD release The Original Mono Recordings, R-0050 is no longer a rarity. 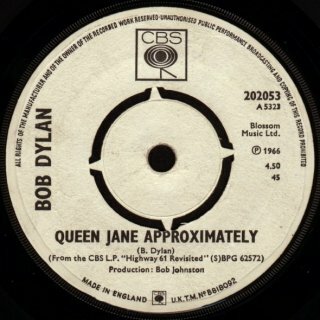 The other side of this single was Queen Jane Approximately from the mono Highway 61 Revisited album. 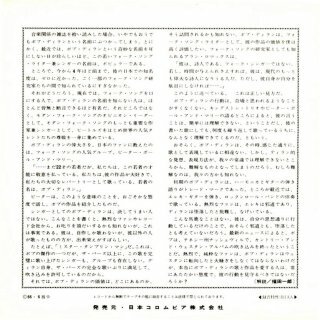 This has matrix number JZSP-113095 and was the A-side in several countries. (Normally the lower matrix number is the A-side, and Queen Jane Approximately was JZSP-113095 while One Of Us Must Know (Sooner Or Later) was JZSP-113096. 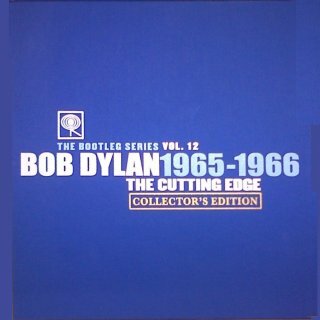 The 18CD Collector's Edition of The Bootleg Series Vol. 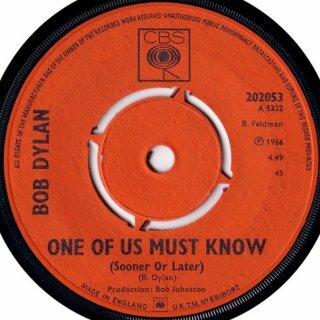 12 - Bob Dylan 1965-1966 The Cutting Edge includes nine of the mono 7" singles released in 1965 and 1966 with new picture sleeves and a "leopard-skin" spindle with which to play the singles. 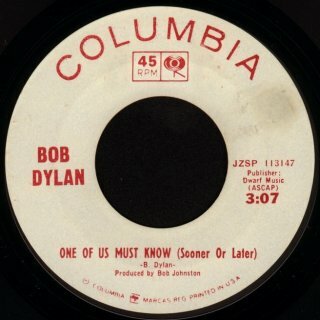 Columbia 4-43541 from Feb 1966 is included as Columbia/Legacy 88875124402-(SV)5 with the US commercial single labels. 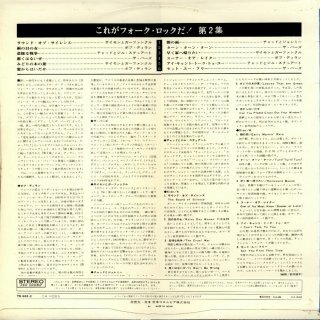 The front is from the Japanese single release CBS LL-919-C below, the rear is a curious hybrid of Japanese and German single rear sleeves. 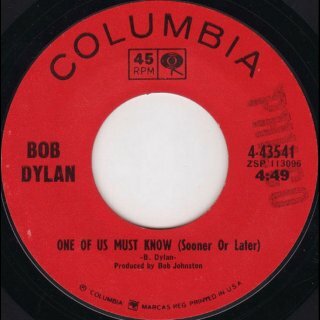 Thanks to Hans Seegers, Al Haug and Manuel García Jara for information and scans. 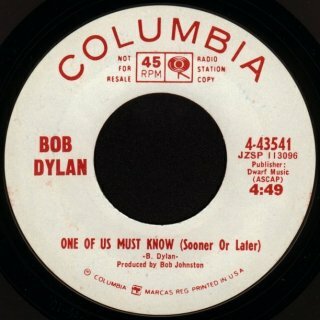 There are at least three releases of this box containing five current Columbia 7" singles: the second release shown here has the same title as this with catalogue number CSP 120-1325, with orange text, not pink as here, with a different Dylan single, I Want You/Just Like Tom Thumb's Blues (live), listed here. 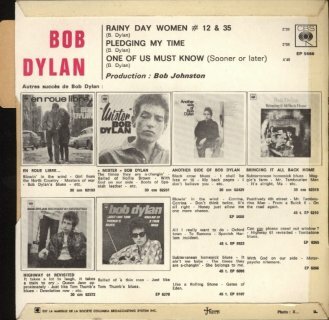 Manuel García Jara points out that the single selection in these boxes was completely random, so there is no point in buying one unless you know it contains a Dylan single! Stefan Haras has a copy where the box has pink text and the same catalogue number CSP 120-1302, but a different title, "VOLUME II" instead of VOLUME I". 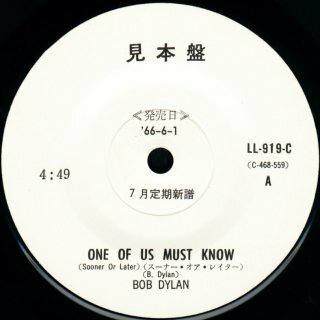 It has the same five singles as "VOLUME I". 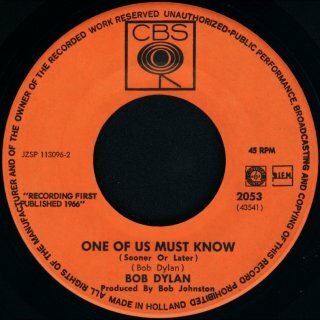 Hans Seegers has another copy of the box with pink text with a third Dylan 7" single, Can You Please Crawl Out Your Window? 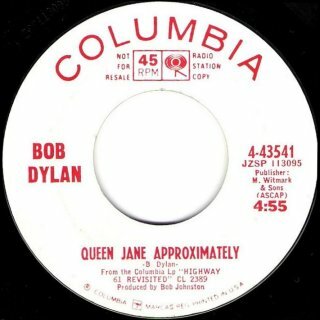 c/w Highway 61 Revisited, see here. Thanks to Hans Seegers, Michael Grasberger, Gerd Rundel, Stefan Haras and Manuel García Jara for information and pictures. 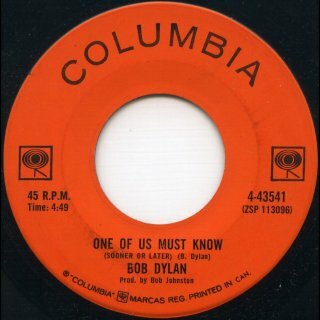 Columbia 4-43541 (Canada) - A-side scan by Tom Willems (R-0050) The commercial Canadian single had orange Columbia labels. 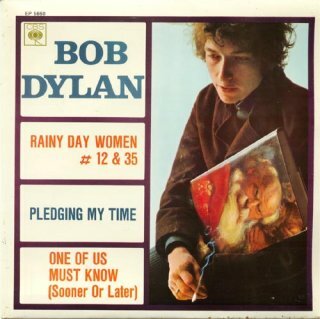 It did not have a picture sleeve. 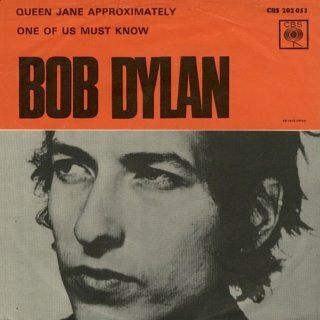 This is definitely the A-side of the UK release! 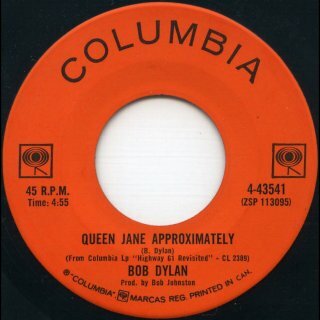 The other side of this single was also Queen Jane Approximately from the mono Highway 61 Revisited album. 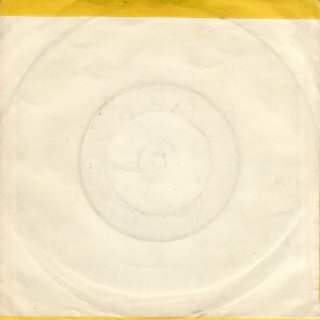 Anton Wennbom's commercial orange label copy has a push-out centre, but Manuel's copy has a solid centre. 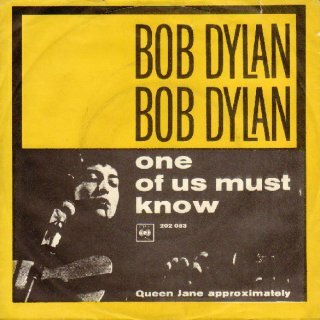 The UK single had no picture sleeve. 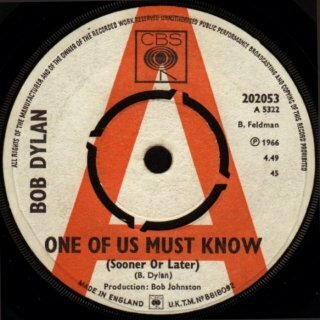 Thanks to Roger Ford for pointing out that "from the UK Official Charts website, the single entered what was then the "Record Retailer" chart on 14 Apr 1966 From info about "Record Retailer", it seems this would probably have been based on sales in the week 4-9 April – they compiled their charts on a Tuesday for publication on Thursday, but based on postal returns which presumably would have had to be posted on the Sunday or Monday. 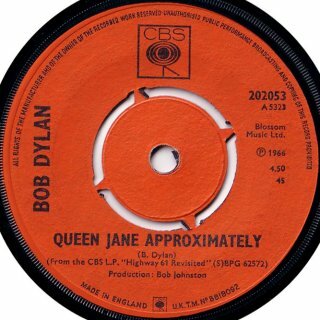 So the UK single release must have been very early April at the latest, and possibly late March allowing for some lag before it entered the charts." 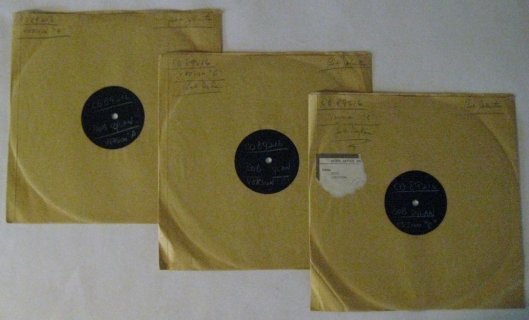 Thanks to Hans Seegers, Anton Wennbom and Manuel García Jara for information and scans. 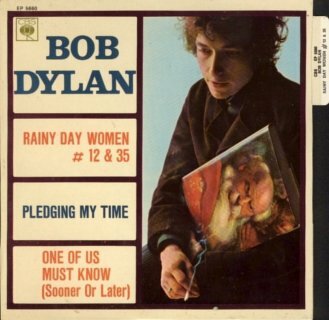 This date may be wrong, because the later Dutch single CBS 2307, Rainy Day Women #12 & 35/Pledging My Time was definitely released in May 1966 (it entered the Dutch charts on 21 May 1966). 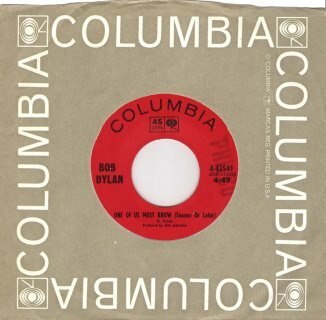 Tom Willems says the book "Hypnotist Collectors" by Jean-Louis Dréau and Robert Schlockoff (Média Presse, France, 1989) gives the release date of CBS 2053 as 8 Jul 1966. 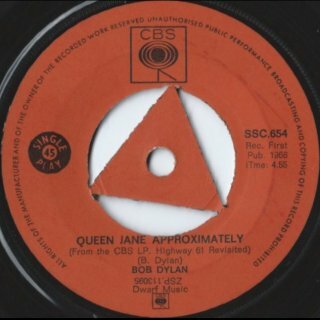 CBS 2053 did not enter the Dutch charts, so they're no help. 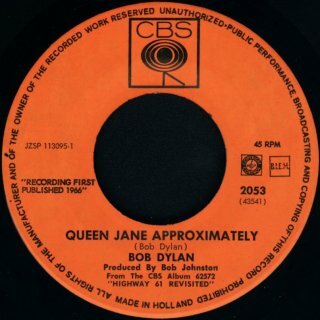 Tom says another source gives the Dutch release date as after 12 Aug 1966, and definitely after CBS 2307! 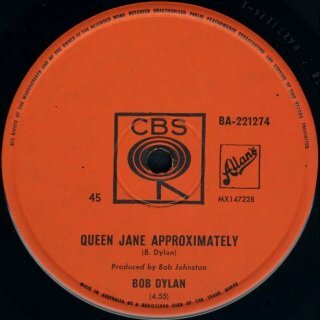 The Dutch single had a picture sleeve, but the A- and B-sides were reversed, so that Queen Jane Approximately was the A-side! 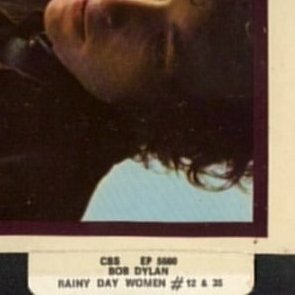 This was the first Dutch single to have a sleeve with a different rear showing pictures of contemporary CBS Holland singles. 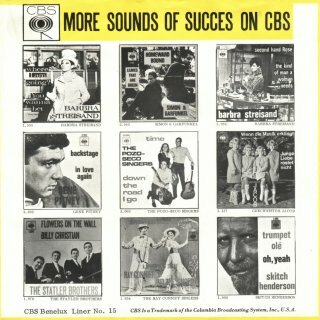 "SUCCESS" on the rear sleeve is misspelled "SUCCES". 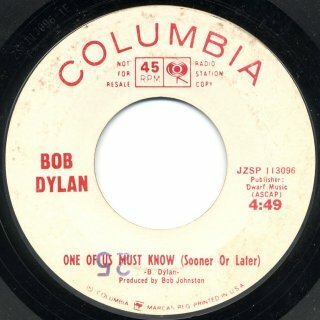 The Dutch single has two label variations, the first shows the playing speed as "45 rpm" and the second as "45 RPM", placed slightly differently. 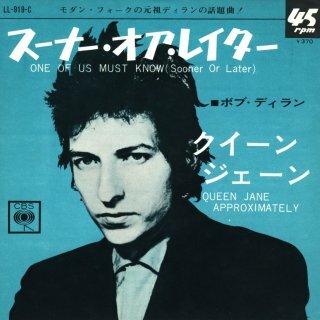 Thanks to Francisco Lima for information and to Hans Seegers for information and scans. Like the Dutch single above, the Swedish single had the A- and B-sides were reversed, so that Queen Jane Approximately was the A-side. 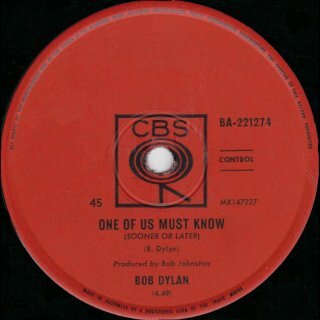 The Danish single had One Of Us Must Know (Sooner Or Later) as the A-side. 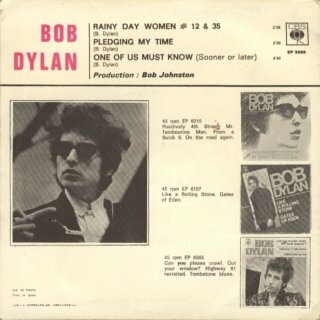 Even though thee singles were pressed in Oslo, Norway, I haven't found an example of a Norwegian sleeve! 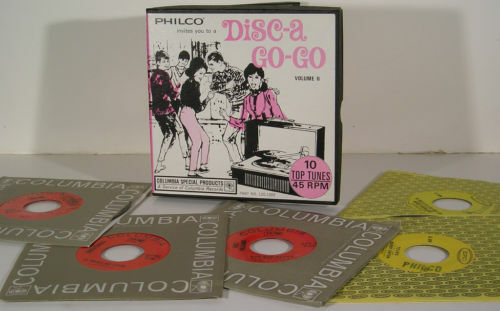 Information from Hans Seegers: "Until 1973 all Scandinavian releases were pressed at the PolyGram pressing plant in Oslo, but up to 1968 the CBS companies in Norway, Denmark and Sweden printed their own picture sleeves. 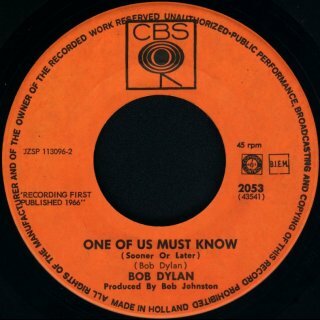 The labels of these Scandinavian singles are therefore completely identical, and all have 710 in the matrix number." 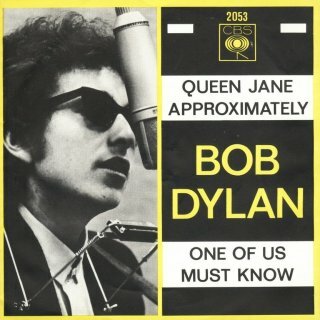 Thanks to Hans Seegers and Magne Karlstad for information and scans. 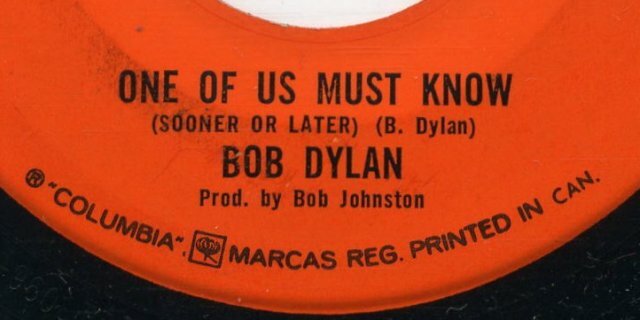 These singles had no picture sleeve. 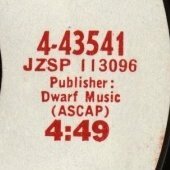 The length of the A-side is shown as 4:55. 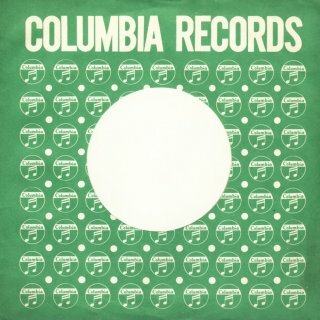 To the right of the centre hole the A-side has "CONTROL" while the B-side has the Allan's logo. 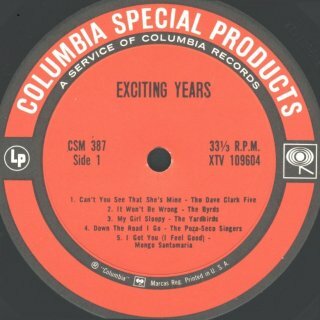 Manuel García Jara has a copy of the single where there is a narrower gap between the central CBS logo and the song titles, especially on the B-side. 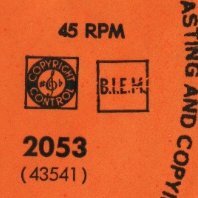 The Allan's logo on the B-side is equidistant between the catalogue number and the matrix number - on the B-side of Hans' copy it is lower. 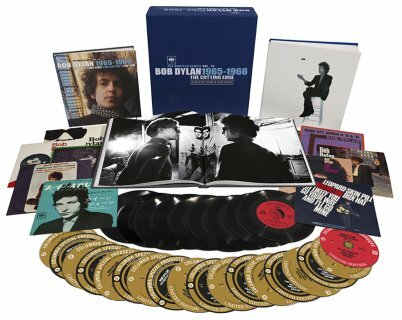 Scans of the South African release required! 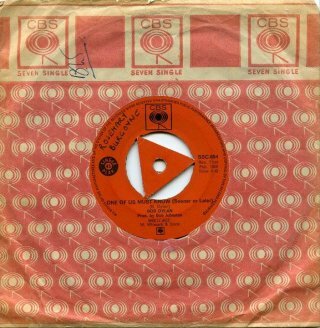 It does not have the distinctive triangular centre of the Rhodesian single. 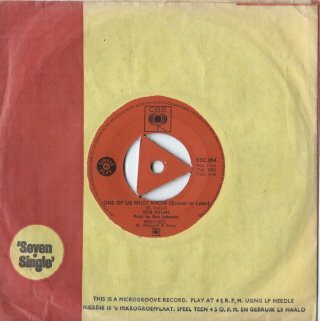 The first Rhodesian release illustrated came in the same "CBS Seven Single" sleeve as used in South Africa. 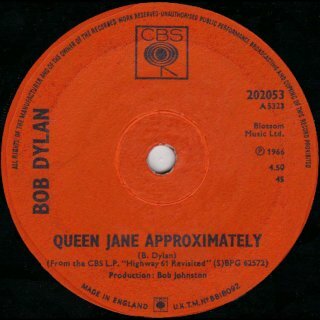 Amazingly, it belonged to a woman called Rosemary Burgoyne, whom I knew when she and her husband lived in Didsbury in Manchester in the late 1960s! They subsequently moved to South Africa, where she still lives, although her husband has now died. 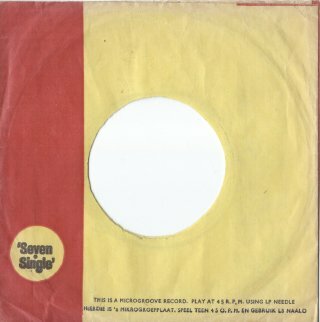 The second Rhodesian single comes in a unique yellow/brown "Seven Single" sleeve with text in English and Afrikaans. Thanks to Ed Ricardo, Tom Willems and Jim Siddy for information and scans. 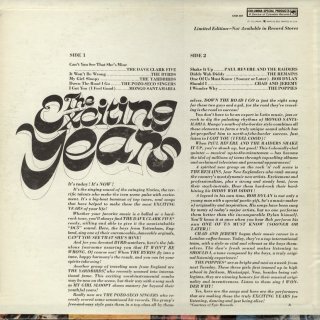 For a more detailed entry on the variants of these two EPs, see here. 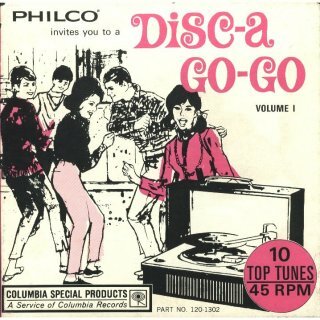 Note the unique languette or index tab on the French EP - for more information about languettes, see 1965. 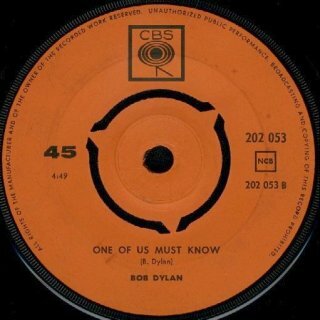 This single is very rare indeed, and the promo version is almost impossible to find! 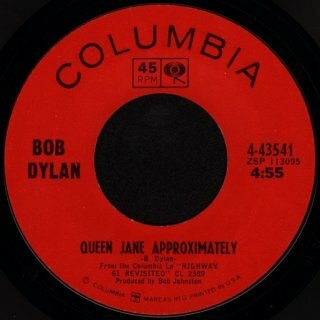 The other side of this single was Queen Jane Approximately from the mono Highway 61 Revisited album (4:55). 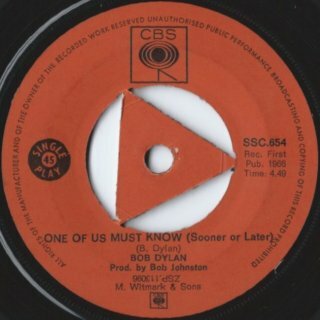 The promo release has white CBS labels with the date "'66-6-1" (1 Jun 1966). The commercial release has orange CBS labels. 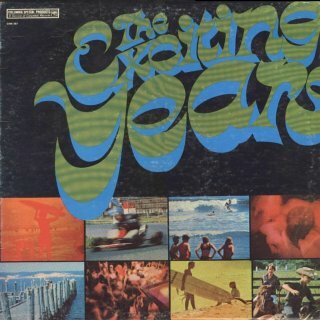 There was a four-page insert inside the generic sleeve with release-specific artwork. 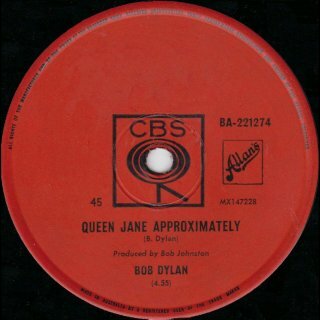 The promo release came in the green Columbia sleeve (the record itself is "CBS"). 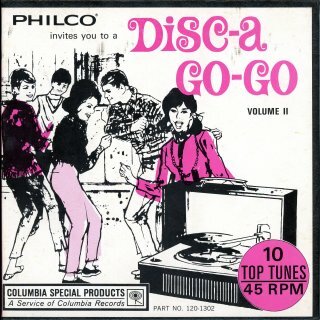 For illustrations of the generic 1966 Japanese sleeves provided by Hans Seegers see 7" Singles Sleeves. 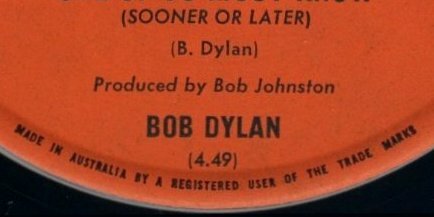 Despite the fact that Bob always rejected claims he invented or ever played "folk rock", CBS insisted in sticking that label on him! 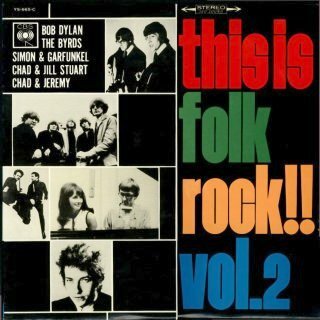 For the first album in the This Is Folk Rock series, see International Compilations: Various Artist Albums 1962-69. 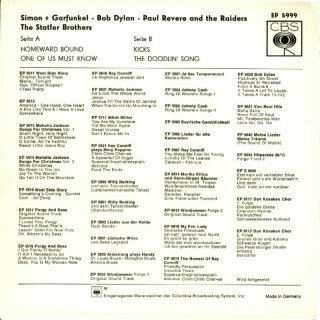 The other tracks on the album are from the Byrds, Simon & Garfunkel, Chad & Jill Stuart and Chad & Jeremy. 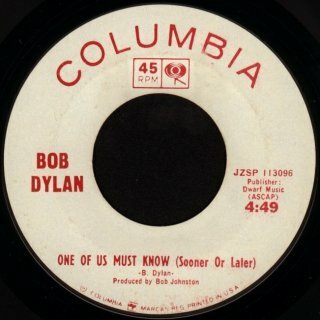 This was a Limited Edition, not available in record stores. 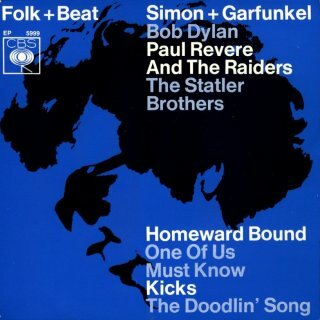 The other tracks on this EP were by Simon & Garfunkel, Paul Revere and the Raiders, and The Statler Brothers. 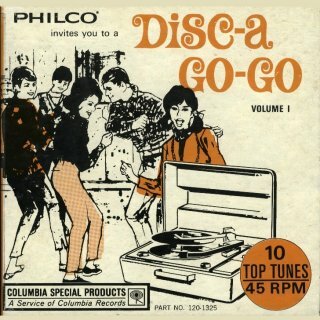 For other West German mono EPs without rarities, see Mono 7" Singles & EPs 1966-68. 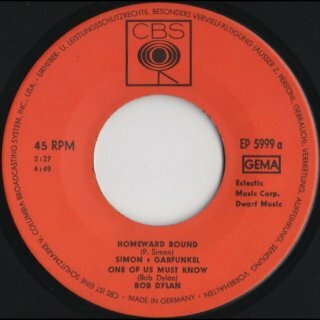 Thanks to Hans Seegers and Ronald Born for information and scans.